Obituary for Tyler S Nims | Boucher Funeral Home, Inc.
Tyler S. “Ty” “Nimsy” Nims, 23, of Ashburnham, died at home on Friday, August 3, 2018. Born in Gardner on March 4, 1995, he was the son of Stephen Nims and Paula (Fitzgerald) Nims. Tyler graduated from Oakmont Regional High School of Ashburnham with the Class of 2013. During his high school years, he was a member and Captain of both the track team and the golf team. 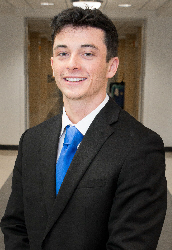 Tyler attended Worcester State College where he was also a member of and Captain of the track team, and was a member and Vice President of the Enactus Club. At the time of his death he was employed as an Apprentice Foreman by Solid Rock Construction of Westminster. Tyler enjoyed working out, golfing, running, fishing and boating. He had an adventurous spirit and loved spending time with his friends. He will be greatly missed by all who loved him. Tyler leaves his mother, Paula (Fitzgerald) Nims of Ashburnham; father, Stephen Nims and his wife Vickie (Petersen) Nims of Ashburnham; two sisters, Gina and Mackenzie of Ashburnham; maternal grandparents, Robert and Lorene (Regan) McLaughlin of Gardner; paternal grandparents, David and Marilyn (Sweeney) Nims of Port Charlotte, FL; aunts and uncles, Lynne and Walter Cole, Jodie and Eddie Murray, Brian Fitzgerald and Celeste Gallagher, Bob and Jackie Nims, Greg and Dina Nims, Mark and Kim Petersen and David McLaughlin; and several cousins. A “Celebration of Tyler’s Life” will be held Sunday, August 26th at 1:00 p.m. at the Polish American Citizens Club (PACC), 171 Kendall Pond Road W, Gardner. Memorial contributions may be made to the Tyler Nims Scholarship Fund, c/o GFA Federal Credit Union, PO box 468, Gardner, MA 01440.